HAIR SYSTEMS FOR MEN HAVE EVOLVED FAR BEYOND THE TOUPEE. LEARN HOW TODAY’S HAIR SYSTEMS CAN GIVE YOUR HAIR BACK TO YOU AND CHANGE YOUR LIFE. Q. Why should I get a non-surgical hair system instead of a hair transplant? 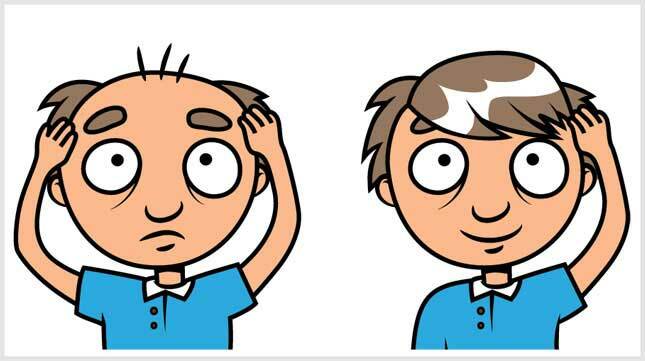 Men lose their hair in a predictable way, a pattern called male pattern baldness (or androgenic or androgenetic alopecia), but aging; stress; medications; poor grooming, sleeping and nutrition habits; and illnesses such as lupus, diabetes and heart disease can all speed up the hair loss process. A surgical hair transplant can replace hair in a bald spot but will not protect against future additional hair loss around the transplant. A non-surgical hair system is your best bet even if you are a candidate for a transplant, because you won’t have to worry about future thinning or anything else. Q. I’m afraid my hair system will fall off — does that still happen? No, your hair replacement specialist will set a maintenance schedule so that your adhesive and attachments are performing optimally as well as to avoid any noticeable wear and tear on your hair system. Q. I don’t want anyone to laugh at me or know that I am wearing a hair system. How can that be avoided? Today’s hair systems are so technologically and artistically advanced that they are virtually undetectable. Manufacturers can even use a base material similar to what is in a contact lens that is so light and breathable it looks as if hair is growing right out of the scalp. Skilled hair replacement specialists can match any scalp color and hairline (from photos of you) and also determine a maintenance plan so that wear on the hair system never shows. Q. How many hair systems do I need? You may hear conflicting information about how many hair systems you will need. Your plan depends on the type of hair system you are wearing as well as your lifestyle. If you are very active, you may need more maintenance and more hair systems. Some hair replacement specialists may say that you need two to start out with so you can rotate them and wear a fresh one while another is being repaired and maintained. Many hair systems are made using such lightweight materials (the heavier the hair and cap, the less natural a hair system will look) that they are disposable, requiring a new one every time, about every eight weeks or so. Q. Why throw a hair system away when it looks perfectly fine? You should replace a hair system before it shows any wear. Otherwise outsiders might be able to see a hair system’s hair loss or cap fraying — and you wouldn’t want that! Q. Does the hair system always have to have the same style over and over? If you’re adventurous and want to switch styles or colors, you can certainly work with the stylist to create different hair systems, or you can stick with one that represents “your look” time and time again. Q. Will my hair system change as I age? Everyone should want their hair system to be as realistic and natural as possible, and if that includes shortening your style or showing some graying, your stylist will strive to make your hair system as age appropriate as you desire, matching it to your changing facial shape, hair color, hair texture and skin tone. For men, lessening the amount of hair to match any overall thinning or pattern baldness around the system also may be appropriate as you age. Q. Can I have the kind of hair system that is removed at night, or does it have to be attached for a month or more at a time? It is your choice how you want your hair system to be attached and also how much care you want to take with attaching it yourself. Your hair replacement specialist will work with your lifestyle considerations to determine the best method of attachment and schedule for removal and replacement. Q. What is the difference between a custom-made hair system and an “off-the-shelf” hair system? A custom-made hair system is made by molding and measuring your head or hair loss area and is created strand by strand to match your exact hair density and hairline. These are usually the most expensive types. A ready-made hair system can be bought off the shelf, but it will still be cut, colored and styled based on your skin tone and facial shape by working with your hair replacement stylist.